We have just released our new website. DJ services and equipment hire in Aberdeen and Aberdeenshire. Our Salsa Classes for Beginners & Latino Nights are back ! Dance Salsa ! Speak Spanish ! Vive la Pasion Latina ! Choosing a venue for your party is key and finding a venue that suits you and your party can be difficult. Over the years, many of our customers have found themselves in a situation where they just don't know where to go. Our company prides itself on being helpful and understanding towards our clients and we have been lucky enough over the years to have had the opportunity to help many of them. So much so that we have compiled a list of our most popular venue choices for you! We can provide our DJ services at any of the following venues. This venue is situated in the West End of Aberdeen and is easily accessible with its own fairly large parking lot. It's function room is very spacious and can accommodate around to 120 people. With its own dance floor and a wide variety of food on the menu, this venue is perfect for birthdays or formal events. licensed bar and the staff provide excellent service. This venue is mainly popular for children's event however it can also be hired for more formal events. The club has 3 separate bar areas, two on the ground floor and one on the first floor. All these rooms are comfortable and can be used for meetings, social occasions and parties, as well as providing refreshments for members, guests and all other club users. This venue is for smaller parties and its main function room can accommodate up to 50 people. One of our most popular options, mainly due to its wide range of suites available to suit your events requirements.Whether you are planning a reception for 200 people, wedding, seminar, breakfast meeting, meeting for 2 people, Christmas party or an annual dinner dance, the Station Hotel with a choice of 7 versatile suites. Each one tailored to host different types of events. Spacious venue with big dance floor, popular for dance parties and birthdays. Function Suite which has the capacity for 110 people standing and 80 people seated. Catering can be included and sound system is provided. They have a 3m HD Projector Screen in the Function Suite complete with full integrated audio system, which is perfect for any presentation required. Big function suite which is easily accessible, as it is located in the center of Aberdeen. The Palm Court Hotel features a wide variety of Celebrations and Private Dining Rooms that are ideal for your event.Parties of 6 to 150 can be fully accommodated with a tailor made package to suit your exact requirements. Set menus, buffets, drinks packages, DJs and live bands available on request. This bright, modern hotel lies in the city centre, within 1 mile of Aberdeen train station. A relaxed restaurant serves both traditional Scottish and American dishes. Close to the airport and other transport methods. Offers a grand function suite which again can be tailored to your specific event, this suite is also a very common choice for wedding receptions and after parties. areas to choose from, including the Crystal, Rubislaw, Half Crystal and Gilcomston Suites. -The Crystal Suite is our most spacious function room at 816m² and can accommodate up to 200 guests in theatre-style seating.The Crystal Suite's extensive space is also ideal for dinner dances, cabaret, banquets and receptions. - The Crysta Suite (half) is ideal for fine dining, as it measures 408m², and can accommodate up to 100 guests in a reception style layout. -The Gilcomston Suite is ideal for intimate gatherings, as it measures 54m². The suite can accommodate up to 30 guests in a reception style layout. -The Rubislaw Suite is ideal for social and corporate events alike, as it measures 115m². -The Rubislaw Suite can accommodate up to 30 guests in a theatre style layout, or seat 40 individuals for a reception. We hope this article helped you decide on your venue,also keep in mind we can provide our DJ services at any of the venues above! These are the most popular bachata songs at our Bachata Classes Summer 2015. We hope you like them as much as we do. I missed the night at The Forum again. I had to spend a few hours doing my unavoidable taxes. However, I managed to listen a few "Salsa Classics". That is how I would call songs that will always be in people's hearts and minds. My favourite "Salsa Classic" this weekend: Quimbombo - Hermanos Moreno. I hope you like it too ! 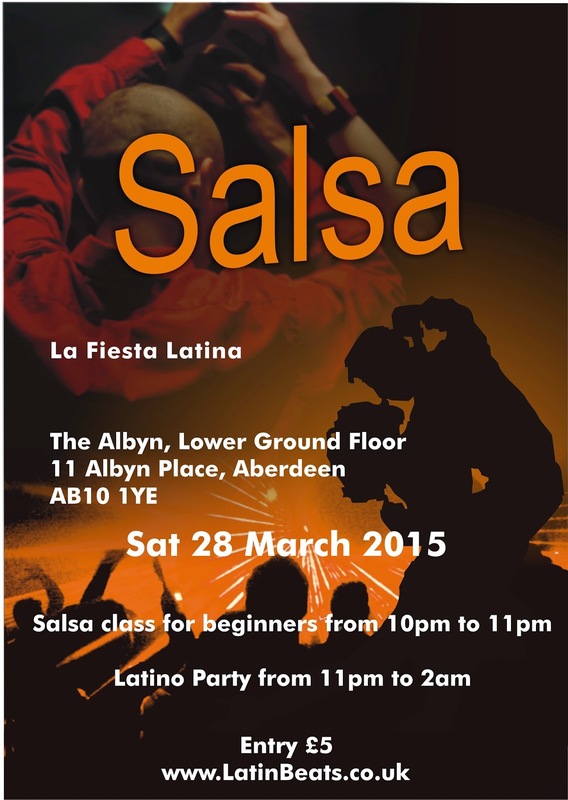 New Salsa venue & 100% Musica Latina. The Albyn, Lower Ground Floor !! !